No one still believes that we will win. On Tuesday night, it all fell apart for the U.S. men’s national soccer team. A seven tournament, 24-year streak of consecutive World Cup berths was snapped in cartoonishly heartbreaking fashion. Coming into the match, American fans were rightfully confident. All it would take to qualify for the World Cup was a win or a tie against Trinidad and Tobago, a team that had nothing to play for but pride and only one win in nine matches in the final qualifying group. And even if somehow the U.S. lost, Honduras and Panama would both need victories over the top two teams in the group, Mexico and Costa Rica, to complete the elimination. If the USMNT lost and only one of Honduras or Panama won, the US would be headed for a playoff against Australia. By ESPN’s Soccer Power Index, the United States had a 93 percent chance of reaching its eighth consecutive World Cup. Then the U.S. conceded two goals in the first half — first an own goal and then a blistering 35-yard strike — despite giving up little in the way of high-quality chances. And despite a halftime switch to bring on Clint Dempsey and line up two attackers behind strikers Bobby Wood and Jozy Altidore, the U.S. could not create the chances to level the score. USMNT fans could only watch in horror, and Panama and Honduras both clawed back first-half deficits to knock the U.S. out of World Cup qualification. U.S. men’s soccer is obviously no stranger to embarrassment and heartbreak on the international stage. In the 1998 World Cup and the 2006 World Cup — the last two on European soil — it combined for one tie and five losses. In 2015, the team was stunned at home in the Gold Cup semifinal by Jamaica, which at the time was ranked 76th in the world by FIFA. But what happened Tuesday night may stand alone. Looking only at World Cup matches and qualifiers, it was the worst loss in USMNT’s history based on the Elo rating system. Going into the game, Elo gave the U.S. an 83 percent chance of beating Trinidad and Tobago, making the Americans huge favorites even after accounting for the fact that they were playing on the road. Going back to 1885, the American men had never lost a match at that level when they had such a high probability of winning. And it came with all the chips on the table. You cannot blame U.S. soccer fans for being a little woozy this morning. Only includes matches that were at the World Cup or World Cup qualifying level (i.e., excludes continental championships, friendlies and minor tournaments). Games played in neutral locations denoted with a dash. Before coach Bruce Arena gets too much of the blame, it’s important to remember that it was the failures of the team under his predecessor, Jurgen Klinsmann, that put the Americans in this position in the first place. The team lost to Mexico and Costa Rica last November in this qualifying cycle, which led to Klinsmann’s ouster. And, ultimately, losing those points made what should have been a meaningless game against Trinidad a must-win. Earlier last year, the same Klinsmann team also inexplicably dropped a game to Guatemala in the group stage of qualifying, the second-worst loss by Elo. The advantages the U.S. squandered are many. America finally has a legitimate men’s soccer superstar in Christian Pulisic, but he alone could not score two goals for the team. (He got one.) And it’s not just a question of talent: The U.S. towers over these CONCACAF opponents when it comes to resources. Trinidad and Tobago, after all, has a population of 1.2 million — or roughly the size of the greater Hartford metro area. 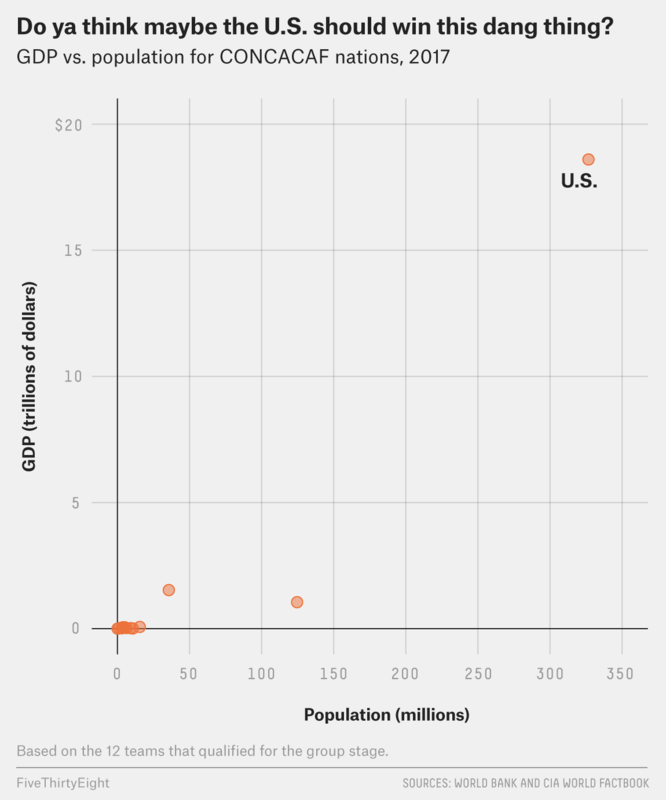 Here is how the 12 countries that made the group stage of the 2018 CONCACAF World Cup qualifying compare in gross domestic product and population — it probably won’t be hard to spot the U.S. This is not to say that money and size are everything in international soccer. The two biggest countries in the world by population — China and India — have made the World Cup just once (China in 2002), whereas Iceland, a country of just 340,000, will play in its first next summer. But the U.S is different. It has spent the last decade talking about long-term plans for soccer development. The U.S. Soccer Federation increased its staffing and pay for national team coaches and introduced new youth initiatives to build a better team from the ground up. It is hard to see the results of these ambitions on the field. 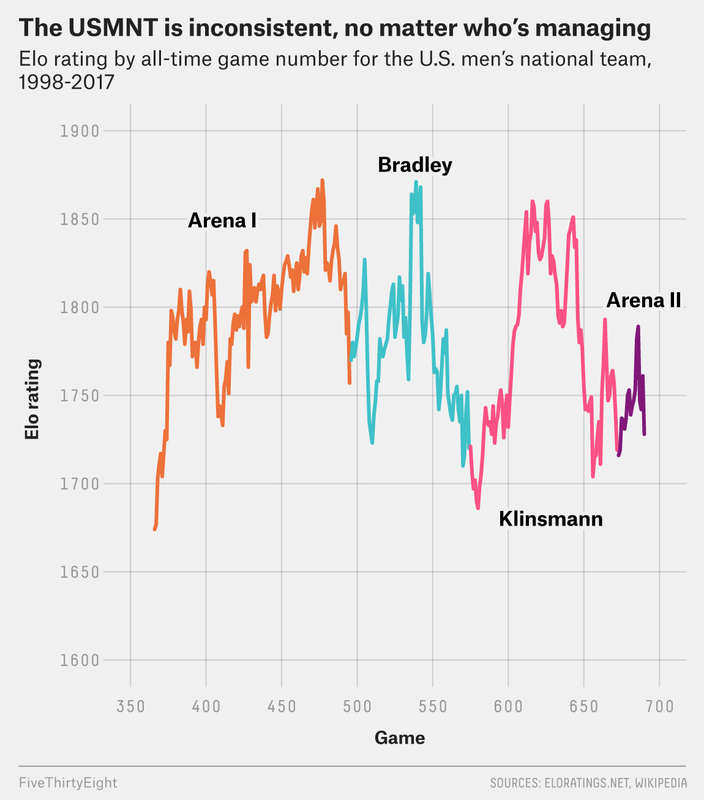 A chart of the U.S. team’s Elo rating over the past two decades shows not so much steady growth but a series of peaks and valleys with, at the moment, no overall progress to speak of. For every step taken, there’s been a step back — no matter who has been the coach. The team made a breakthrough in 1994 when it reached the knockout stage for the first time in the expanded World Cup era.1 It followed that by crashing out in 1998. The Americans stunned Portugal in the group stage in 2002 and made its first modern-era quarterfinals with a win over Mexico in the round of 16. It followed that by being a complete also-ran in 2006. So if the heroics in 2010 and 2014 — when the team fought through tough groups to survive and advance in dramatic fashion — gave the U.S. any confidence, it has just been completely wiped out. It was expanded to 24 teams in 1982 and to 32 teams in 1998.